The question of how much technology is too much is a common one, and one with which singer Alanis Morissette says she, too, struggles. So you don’t have a phone with you all the time, constantly? “No, I do,” she said. “We’ve had a lot of debates in the neurobiological community about how much technology (is good). Morissette said she does post to Instagram and Twitter for a couple minutes, for example, after a concert. She also allows her 18-month-old child, Ever, access to technology, in small doses. “I’ll allow a little bit in for my child that’s appropriate viewing, that’s kind of fun and whimsical,” Morissette said. 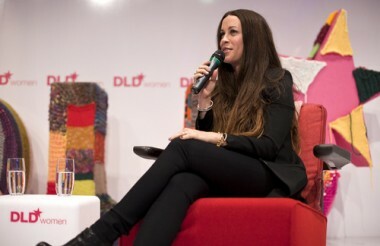 Morissette was a surprise addition to the DLDWomen lineup, taking the stage earlier in the day on Thursday, following a video shoot in Berlin. Morissette encouraged the group of women from around the world to embrace their power as leaders. These days, though, roles are changing for both men and women. She urged the crowd to embrace that change. Morissette said her husband is still providing for her, though at the moment, he was providing by taking care of Ever so that she could be at the conference. “In days of old, they would bring home the veggie bacon,” said Morissette, a vegan.